The Virginia House of Delegates 27th District is located within Chesterfield county. 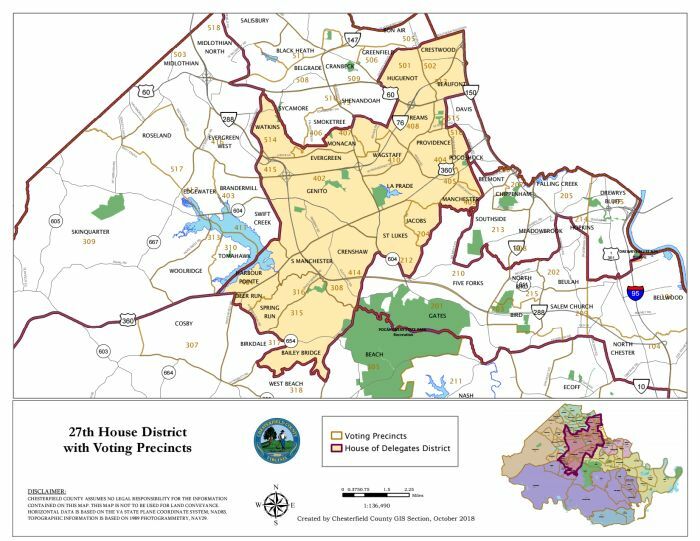 It includes the following voting precincts: Bailey Bridge, Beaufont, Clover Hill, Crenshaw, Crestwood, Deer Run, Evergreen, Genito, Harbour Pointe, Huguenot, Jacobs, La Prade, Manchester, Monacan, Pocoshock, Providence, Reams, St. Luke's, S. Manchester, Spring Run, Wagstaff, and Watkins. Approximately 85,000 people reside in the district.